The 2015 VDP Mosel Auction led to record breaking prices and many affordable wines. Here a summary of the event. 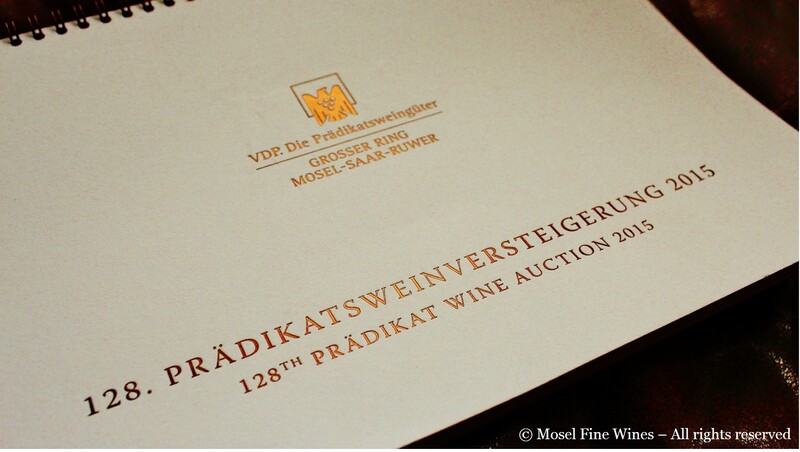 Every year, member Estates of the Grosser Ring / VDP sell some of their most prized wines via an Auction held in Trier. This year's Auction was held on September 18, 2015. As usual, the wine world of Riesling converged on the Mosel and celebrated the beauty of Mosel wines. Given the profile of the vintage, many producers brought some Kabinett to the auction, a welcome move playing on one of the strengths of the Mosel: Lightness and fragrance. Overall, the price for these special selections of Kabinett wines remained quite reasonable. Among our favorites, the juicy Kanzemer Altenberg Kabinett from Weingut von Othegraven went for €25, the delicious Ayler Kupp Kabinett Fass 5 by Weingut Peter Lauer for €27, and the superb Brauneberger Juffer-Sonnenuhr Kabinett by Weingut Fritz Haag for €37. Also the Spätlese remained in line with last year’s price levels ... except for the wines from Weingut Egon Müller, whose prices went through the roof: the Wiltinger braune Kupp Spätlese went for €70 and the Scharzhofberger Spätlese for a staggering €174 per bottle! The beautiful Bernkasteler Lay Riesling Auslese by Weingut Joh. Jos. 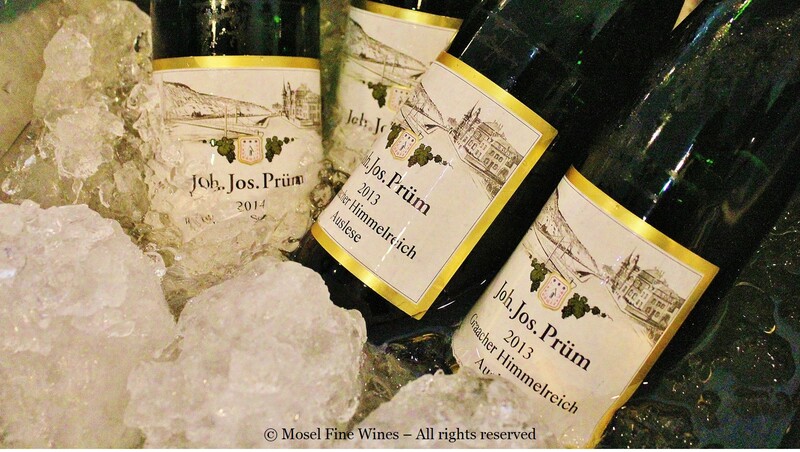 Prüm proved a bargain as its price, at €90, makes it the least expensive Auction Auslese from this Estate in years. In fact, it even went for less than the Estate’s Wehlener Sonnenuhr Spätlese! Other Auslese also proved cheaper than in previous vintages, partly because many Estates brought regular Auslese and not Auslese GK to the Auction. Here again, the price for the Scharzhofberger Auslese GK by Weingut Egon Müller shot through the roof. A 75cl bottle of this stunning success and a clear candidate for Auslese of the vintage (see the tasting note in the Mosel Fine Wines VDP Mosel Auction Guide 2015) burned a hole of €770 in its buyer's pocket. Also the Weingut Geltz-Zilliken set a new record for the Estate with its perfect 2005er Saarburger Rausch TBA, which sold for €1,100. Overall, the whole event was dominated by the high demand for the wines from Weingut Egon Müller. This also reflects in the resulting turnover. Although he sold "only" 5 wines, Egon Müller pocketed almost one third of the total turnover made at the Auction! The detailed list of Auction results can be found on the website of the Grosser Ring / VDP (please note that the prices indicated on the site are those for German private consumers, i.e. based on German VAT rates). An overview of all hammer prices and a detailed look-back at the Auction can be found in the Mosel Fine Wines Issue No 29 (Oct 2015), which also includes Part II of our extensive 2014 Vintage Report. Note: We refer in this article to the hammer price (i.e. before commission fees, sales tax and any shipping costs), as these additional costs may depend on the region in which the buyer of these wines lives.